Thumperpump’s experience isn’t atypical. Plaster pools can begin to crack if the underlying structure is installed incorrectly. Using our Ultraguard pool repair system, we can help you repair your pool surface should it begin cracking. While we can’t fix the underlying structural issues, like Thumperpump’s, if your plaster pool has cracking you can use our crack repair product and then our Ultraguard pool repair system to put a new coat on the surface. UltraGuard Swimming Pool Resurfacing is an effective measure in combating cracks and pool leaks! Because the surface is a structurally strong, waterproof barrier, it prevents or covers unsightly surface cracks and reduces water loss through leaks. In turn, less chemicals and water need to be replaced. Using our 11,700 PSI structural putty helps create a watertight seal. 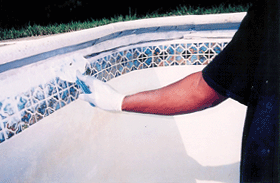 A leaking pool becomes a thing of the past with UltraGuard’s exclusive “T” repair crack system. This creates the ultimate monolithic watertight barrier. Do you have pool repair questions? If you would like to discuss how Ultraguard could be the solution to your pool problems, be sure to fill out our questionnaire and then call me, Ken, at 1-888-639-7695. Copyright © 2019 · Ultraguard Swimming Pool Resurfacing. All Rights Reserved.